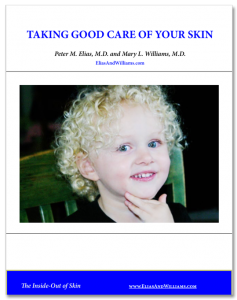 5 Things To Help Sensitive Skin - Elias and Williams: The Inside-Out of Skin by dermatologists and skin researchers Peter M. Elias, M.D. and Mary L. Williams, M.D. 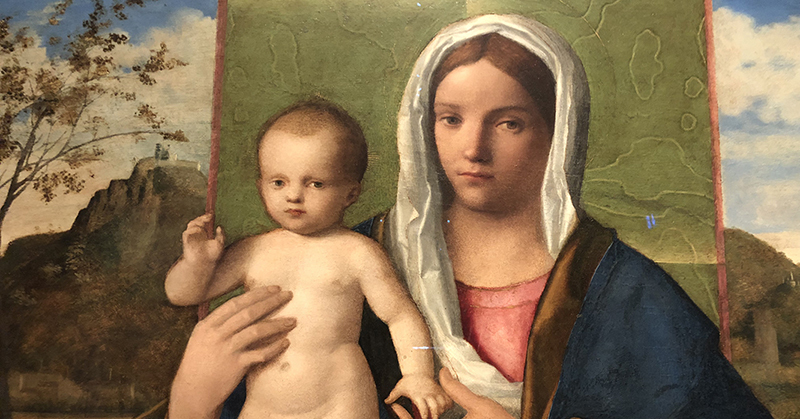 Detail of G. Bellini’s Madonna and Child in the Brera Pinacoteca, Milan, Italy. Like babies, many of us have sensitive skin. Photo by Mary L Williams. Q: My skin seems to reactive to every skin care product I use? What should I do? A: Here are 5 things people with sensitive skin can do to avoid problems with skin care products. 1. Caveat emptor. Remain skeptical of the marketing claims about the benefits for the skin that are promoted in advertisements. These are designed to sell you their products – not to accurately and objectively report upon their effects on skin. 2. Start Slow. Test a new product before applying it widely to your skin, particularly to your face. Choose a ‘test area’, perhaps behind one ear or in the fold of an elbow, and observe whether the treated skin becomes irritated over time. If it does not irritate the test area after a week or so of once to twice daily applications, then you can cautiously begin to use it more widely. If you would like to obtain objective data about how your skin is being harmed or helped by your skin care product, there is a simple, hand-held device (GPSkin Device), available from GPower, Inc. This easy-to-use device can provide day-by-day changes in you skin’s barrier function and moisturization. The expense of this product may not be worth it for everyone, but for those who are really struggling to find safe and effective products this could be cost-effective in the long run. 3. Consider allergy. If a product has produced a very intense reaction, with marked redness and blistering, or if the reaction does not go away in a day or two after you stop using it, consult your dermatologist. You may have developed an allergy (‘contact dermatitis‘) to one or more of the specific constituents of the skin care product. Many of these allergens are found in multiple products, and finding the cause of your outbreaks through allergy testing (‘patch testing’) could save you lots of aggravation in the long run. 4. Keep your skin healthy. Do you have atopic dermatitis, another eczema, such as seborrheic dermatitis, or rosacea? If so, make sure that these other skin conditions, which can that predispose you to sensitive skin, are treated by a dermatologist. If you over the age of 50, have red-hair hair or if you are under an inordinate amount of psychological stress you may need to take extra precautions to keep your skin in the best possible shape. See our free pamphlet “Taking Good Care Of Your Skin” for practical advice on how to do so. 5. Go with the tried and true. Because so many skin care products are potentially toxic, consider using skin care products with proven efficacy for the skin barrier. These should be safe for anyone, even those with underlying skin problems. One example is a product based upon our research, called EpiCeram® emulsion. While EpiCeram® is available only by prescription, there are other non-prescription products that have demonstrated benefits for the skin barrier. Finally, remember that it is probably not you. Even if you have an underlying, predisposing skin condition, the products that you are using may be the culprit, rather than your underlying skin disorder. Put the blame where it belongs.